I remember the day the BM940 came out very well. At that time, Benchmades were very much in my budget range, and I had no customs. Times have changed, but the BM940 remains one of my favourite production knives. If it weren’t for bordem and always needing to get something new, this knife would probably be my EDC. The Benchmade 940 Osborne is a really great EDC, especially for office folks like me. The reverse tanto style blade give the knife a lower tip, maybe it good for tasks like opening envelopes and packages, while the slim profile and axis lock make it a elegant knife to use and less noticeable in the pocket. 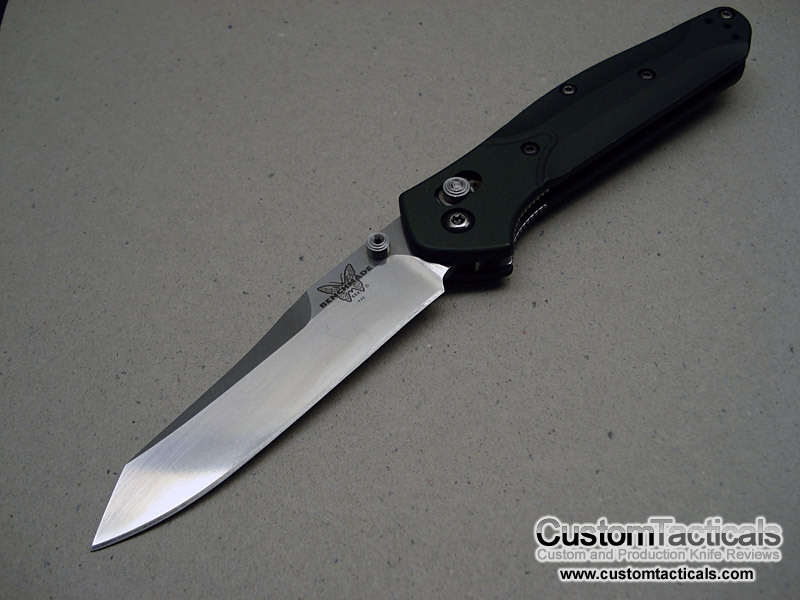 Blade on this example is 154CM, however Benchmade changed the blade steel from 154CM to CPM S30V on this model in 2006, which means this is an older example. Though S30V has better general properties than 154CM, Benchmade’s heattreat of S30V has been less than perfect in the past, with numerous chipping problems. They have improved the process now and it does seem more reliable, however. 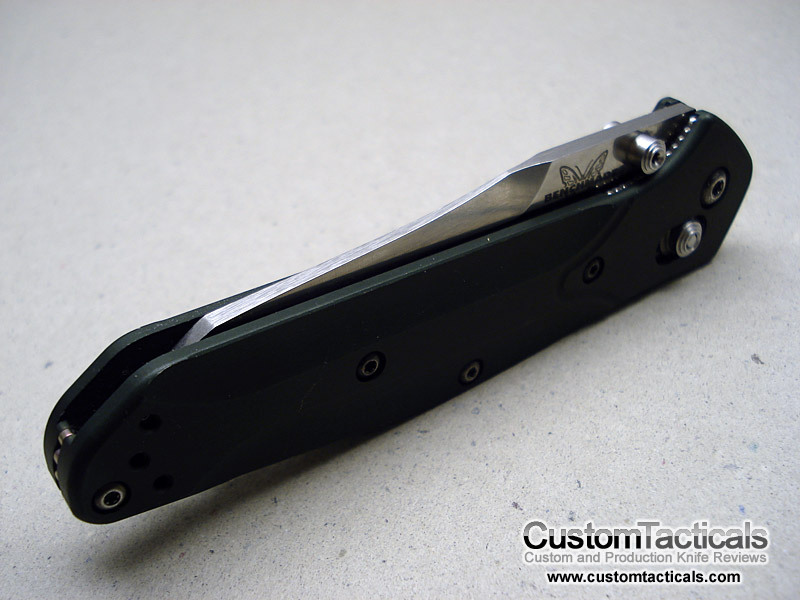 The handles on the BM940 are hard annodized green aluminum with steel liners to house the Axis Lock and Omega springs that operate the locking mechanism. There is an annodized purple titanium “backspacer” that is about 2mm thick. Not sure if it should be considered a backspacer, or more of a design element. Either way, it looks good. The BM940 represents a very good slim and compact knife with a good length of blade, with a stonewashed finish that hides scratches well. The axis lock is safe and makes the knife more compact, and also gives it that smooth opening that all axis lock folders seem to have. 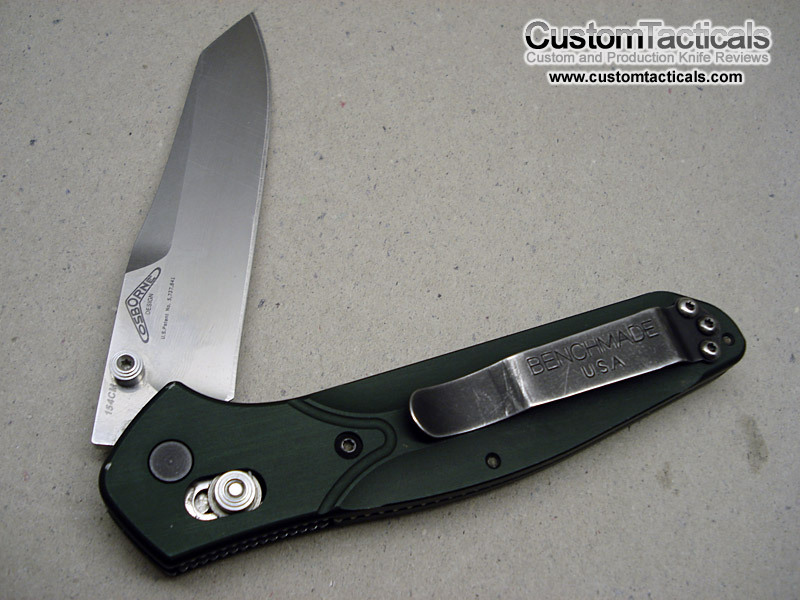 The 3.4″ blade is plenty for doing most medium duty chores, while its slim profile is great for EDC Office carry. If you are looking for a heavier duty knife, this is not your best choice, but this is great for medium and light duty. The contoured handles are extremely comfortable to carry, but may feel a bit thin for larger hands… all in all, still a fantastic knife, and like all knives, can’t be perfect for everyone.